I first discovered Elie Wiesel’s writing at the age of 16. I used to haunt the classics section of my local bookstore, both because those titles introduced me to new, unfamiliar worlds, and because most were produced as mass market paperbacks that were affordable to a teenager with a modest income. Wiesel’s most well-known work, Night, the autobiographical account of his time in a Nazi death camp, sat unassuming on the bookstore shelf. It was a tiny volume of just over 100 pages that sold for $5.50, and yet when I opened it for the first time, it echoed questions I’d held close to my heart about God and His silence, about humanity and its penchant for evil, about surviving in the wake of terrible tragedy. We’d studied the Holocaust in school, but at a distance that left the details vague and turned the real lives affected and lost into abstract concepts. Wiesel stripped bare the stark reality and gave voice to unspeakable horror. The next year — at the start of my senior year of academy — the Twin Towers were attacked. The morning of September 11, 2001 was supposed to be a consecration service for the senior class; instead, we watched on a projector screen in the school chapel as first one and then the second tower fell. The following year — my first year of college — we studied Night, and Wiesel’s words were both familiar and full of new insights about the world. In the years since, Wiesel’s words have been a balm to my faith, doubts, fears, and questions. Though I’ve read many of his books, speeches, and interviews, followed the Nobel Peace Prize winner’s activism in Darfur and many more places, and mourned his death in July 2016, I never knew that throughout it all, Wiesel considered himself first and foremost, a teacher. His work as a professor at Boston University, which spanned over 30 years, was such a central part of his life, and yet is largely unknown. Ariel Burger’s book, Witness: Lessons from Elie Wiesel’s Classroom, brings this area of Wiesel’s life to center stage. Burger first met Wiesel at the age of 15, became his student a few years later, then teaching assistant, and later, friend — a journey that spanned 25 years. 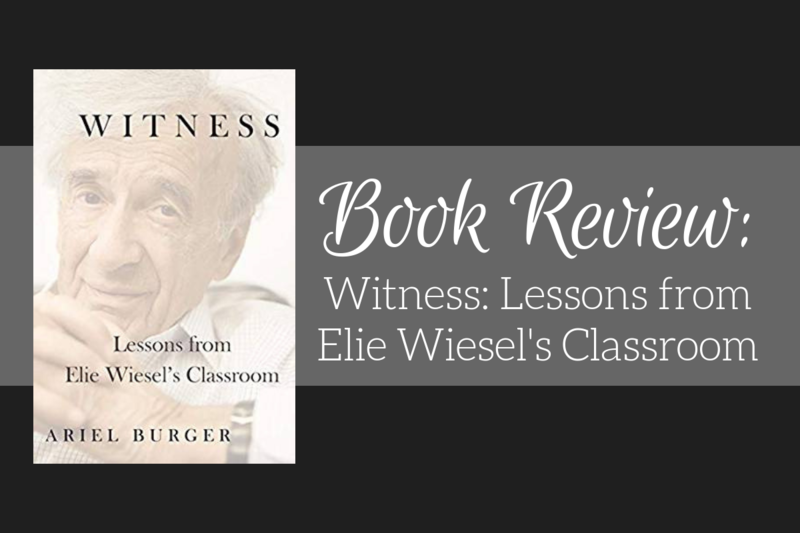 The book is based on Burger’s own journal entries and classroom notes, voice recordings of Wiesel, and interviews with Wiesel’s former students (ix). It is both invaluable coursework and a moving tribute to Professor Elie Wiesel. Burger writes that once, several years ago, he asked a rhetorical question while giving a presentation at a conference: “If we were to create an institute to train teachers and leaders based on the core design principles of Elie Wiesel’s classroom, what would those principles be?” He then described a “methodology of wonder” that “has the potential to awaken students’ ethical and moral powers” (233). Wiesel, who was in the audience that day, took the question seriously and it was the subsequent discussion surrounding this idea that built the framework for Witness. His lessons revolve around topics as diverse as “memory, faith and doubt, madness and rebellion” (xv), and this is where we journey together, as teacher and student, both with questions to ask and answers to seek. Burger unfurls Wiesel’s lesson plan before us, as we are instantly encompassed in an atmosphere of learning, alongside fellow students, as Wiesel lectures. The book is laid out as a classroom conversation on many of the topics Wiesel cared about and taught on: Memory, Otherness, Faith and Doubt, Madness and Rebellion, Activism, and more. Despite what many may assume, Burger tells us that “the Holocaust was not [Wiesel’s] subject; it was the lens through which he looked at all subjects” (16). “History is a narrow bridge. We are naturally afraid of our memories, of the trauma of our memories. We try to forget, and in truth, some things we must forget a little bit, simply in order to function. And yet…if we truly allow ourselves to forget, history may well return to us” (22). In his lesson on Otherness, Wiesel says, “I don’t like the word tolerate. Who am I to tolerate you? I prefer the word respect. I must respect you even if I do not agree with you” (52). Later he continues, “To claim that one path is better than another, to denigrate others, has an almost inevitable outcome: dehumanization” (59). “My questions are questions only because of my faith. My argument with God is an argument only because of faith. Sometimes I have wished to renounce it, but I could not….I believe in a wounded faith. Only a wounded faith can exist after those events [of the Holocaust]. Only a wounded faith is worthy of a silent God” (81, 82). “…do not forget that God invited Abraham to play this role. It’s as if God turns to us, the readers of the future, and says, ‘I’m going to tell Abraham what I intend to do to Sodom so that he will argue with Me. I want to lose this argument.’ God is in an argument with humankind, and God wants to lose. We are invited to argue, to disagree publicly and loudly, with fervor. We learn from this that if you have to choose between God and man, you must choose man — God can take care of Himself” (91-92). “The witness inhabits the world of madness. He sees what is happening with lucidity, but when he reports what he has seen, he appears to others to be mad….In life, too, if you look away from suffering, you become complicit, a bystander. Silence never helps the victims, only the victimizers. If you do look, you risk madness. Faced with such a choice, madness is the better option. It is a better option because at least you will not be on the side of the killers” (111, 113-114). “The ones who recognize the coming of evil, of oppression, are often seen as madmen. They are attuned to a reality that most people do not see, to a vision of a world without hatred, a messianic vision. They live for this vision, and they are so sensitive to whatever threatens it that, unlike others, they react immediately. They are usually the first to raise the alarm” (115). In Activism, Wiesel pulls the concepts of the preceding lessons together. “When you face evil, don’t let it grow, fight it right away. Had Hitler been fought immediately there would have been no Holocaust. Be watchful” (147). I finished reading Witness on October 9. Later that week I attended the General Conference of Seventh-day Adventists’ Annual Council and heard our GC president call social justice a “distraction.” Meanwhile, Wiesel’s words rang in my mind: “Are we sleeping while others suffer? Does our faith cause us to fall asleep? Or does it wake us up?” (100). Two and a half weeks later, the Pittsburgh synagogue shooting occurred. Again, I was reminded of Wiesel’s words as recorded in Witness: “Kindness and compassion must not end with your own community” (159). When our faith leaders fail us and our places of worship are no longer safe, what is left? We have our memories, we have our faith and doubts, we have activism rooted in a righteous madness, and we have, perhaps, hope. “We must hope in spite of despair, because of our despair,” says Wiesel, “we must not give despair the victory. I do not believe the world is learning. And I cannot hide from that fact. And yet, I do not believe in despair. People speak of a leap of faith. I believe we require a leap of hope” (184). If Wiesel’s life and legacy taught me anything, it is this: We cannot remove ourselves from one another’s pain and we shouldn’t remain silent while surrounded by their suffering. “I often feel paralyzed when I consider the enormous suffering in our world. I’ve often let this paralysis stop me from taking even small actions. But now, I don’t expect to find the perfect solution to the world’s problems. I try instead to act in a way that might make a small difference — one person, one family, one classroom at a time….I find myself asking, ‘What would Professor Wiesel do?’ I continue to learn as much from him after his death as I did before it, and his words echo in my mind” (251). When Elie Wiesel passed away, the world lost a great light and the darkness felt tangible somehow. Burger’s book feels like a flashlight beam breaking into that darkness. It’s not as strong as the light that we lost, but it is enough to remind us of the way forward. To show us our own ability to change the world. Alisa Williams is managing editor of SpectrumMagazine.org. A version of this review first appeared on NetGalley. Image courtesy of Houghton Mifflin Harcourt.